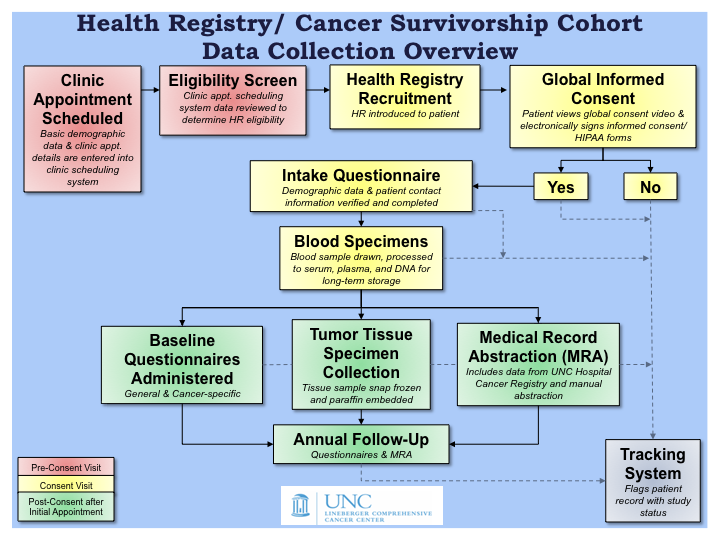 The HR/CSC is a hospital-based registry of cancer survivors who have agreed to the use of their data and specimens for research. This study integrates a comprehensive database of clinical, epidemiological and interview data, with repositories of biologic specimens and tumor tissue. A global informed consent is implemented which covers all aspects of participation in the HR/CSC. HR/CSC participants agree to allow medical record abstraction, procurement and banking of biospecimens (e.g. tumor tissue and blood), research use of all specimens collected as a part of their medical care, and completion of questionnaire interviews at baseline and at annual follow-up, as well as recontact for future studies. The goal of the HR/CSC was to create a cancer survivorship cohort with 10,000 participants and to facilitate research related to cancer survivorship. The figure to the right depicts the overall study design. Explore the resources available to HR/CSC researchers by clicking on the boxes in the diagram above or by accessing the webpages through the menu on the right side of the page. You will find information to support your study and/or publication proposal and details on how to request HR/CSC data and/or biospecimens. When you have found the information you need or if you would like to submit a brief query of our participant data to see if the cohort you are interested in exists in the HR/CSC, visit the "Data Sharing" page and click "Cohort Discovery". When you have located your desired cohort and are ready to start the process of requesting specific data and/or specimens for your study, visit the "Data Sharing" page and click on the "Begin your inquiry here!" button to go directly to the triage form. The triage form is designed to give you an overall view of the HR/CSC processes and provides an effective data collection form to assess the feasibility of your proposal.